Among the many controversial provisions in the NDAA which President Obama signed into law on New Years Eve are provisions aimed at disrupting Iran’s ability to export oil by punishing countries that do business with Iran’s central bank. Although the harshest sanctions on Iran’s bank don’t take full effect for another six months (and Obama says in his signing statement that he will regard the measures as nonbinding if they affect his “constitutional authority to conduct foreign relations”), Iran’s largest oil customers are planning to cut back dramatically on Iranian imports. The European Union has agreed in principal to a complete embargo on Iranian oil and China has already cut their imports from Iran for January and February to half their previous amount. The moves by the EU and China will hit Iran very hard. As seen in the table above, China is Iran’s largest oil importer, buying 22% of Iran’s exports (but this only accounts for 11% of China’s overall imports), so cutting their order for the next two months in half will have a major impact on Iran’s overall oil revenues if replacement orders are not found quickly. 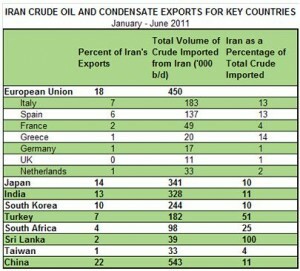 The EU follows closely behind China, buying 18% of Iran’s oil exports. 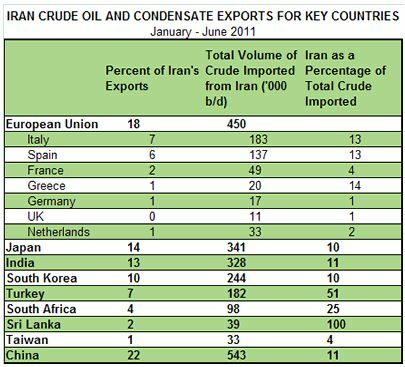 Note that these purchases are not spread evenly among EU nations, as Italy and Spain combine to account for over 75% of total EU imports of Iranian oil. Should the EU embargo actually take place, and even if China does not further reduce its purchasing, Iran is looking at a loss of about 30% of its oil export volume. The bill specifically targets anyone doing business with Iran’s central bank, an attempt to force other countries to choose between buying oil from Iran or being blocked from any dealings with the U.S. economy. Certain sanctions would begin to take effect in 60 days, including purchases not related to petroleum and the sale of petroleum products to Iran through private banks. The toughest measures won’t take effect for at least six months, including transactions from governments purchasing Iranian oil and selling petroleum products. European governments have agreed in principle to ban imports of Iranian oil, EU diplomats said on Wednesday, dealing a blow to Tehran that crowns new Western sanctions months before an Iranian election. Diplomats said EU envoys held talks on Iran in the last days of December, and that any objections to an oil embargo had been dropped – notably from crisis-hit Greece which gets a third of its oil from Iran, relying on Tehran’s lenient financing. Spain and Italy are also big buyers. Iran and the US continued to exchange threats over the long holiday weekend. On Saturday night, Barack Obama signed the NDAA, which put into place the ability to enact strong sanctions on banking institutions involved in the sale of Iranian oil. Substantial flexibility is built into the legislation to allow the US to exempt various players in the oil market, so it is still quite uncertain how the sanctions will be implemented. As the video here shows, Iran also test-fired two types of missiles over the weekend prior to the ending of the ten days of naval war games. However, the threats have not ceased, as Iran has now issued a vague warning to the US not to bring the aircraft carrier John C. Stennis, which exited the Persian Gulf on Tuesday, back into the Gulf. With all of these events taking place, it would be easy to overlook a strange incident on the Iran-Pakistan border on Sunday. Both Iran and Pakistan now say that Pakistan has detained three Iranian border guards who crossed into Pakistan. The guards shot two men who were in a car they were chasing, and one of the men died. The shooting victims are Pakistani nationals. Pakistani authorities have yet to decide what to do with three Iranian border guards who they say crossed into southwestern Pakistan while chasing after smugglers and killed one them, a government official said Monday. The incident occurred Sunday in the Mazah Sar area of Baluchistan province, a desolate, unpopulated region where the border is not clearly marked. Aalam Farez, a senior government official in Washuk district, where Mazah Sar is located, said the Iranians admitted to inadvertently crossing into Pakistan. But, he said, they claimed the two people they shot — one of whom died — were bystanders and that the people they were chasing escaped. After the shooting, Pakistani border personnel chased the Iranians back across the border and detained them, Pakistani officials have said. They also seized the surviving gunshot victim and determined both of those who had been shot were petty smugglers. The Iranians reached Mazan Sar Mashkail, in Washuk district, three kilometres (1.8miles) inside Pakistan where they opened fire on a vehicle they were chasing, according to officials in Balochistan. “All three personnel of Iranian border security force were taken into custody for their penetration inside Pakistan and killing a Pakistani national on our soil”, Saeed Ahmad Jamali, Deputy Commissioner of Washuk district told AFP. Mazan Sar Mashkail is around 600 kilometres southwest of Quetta, the main town of insurgency hit Baluchistan province, which borders Iran’s Sistan-Baluchestan province. Iranian embassy officials in Islamabad were unavailable for comment late Sunday but Iran in the past has blamed a Sunni extremist group, called Jundallah, for launching attacks inside Pakistan [sic] from Sistan-Balochistan. Iranian Navy Plans Wargames for Saturday: Will the Filipino Monkey Show Up? In January of 2008, at a time very similar to now (just under a year out from Presidential elections and with anti-Iran propaganda at a fever pitch in the US media), the Bush administration embarrassed itself mightily in its response to an encounter in the Persian Gulf. As US warships were being approached by five small Iranian craft, a voice came over the airwaves stating “I am coming to you”. A bit later it added “You will explode after a few minutes”. The US quickly claimed this was a threat from the Iranian vessels, but after cooler heads prevailed (and after Iran supplied additional video and audio from the encounter), it was realized that the voice did not match those of the Iranians in the encounter and that the behavior matched that of the legendary radio prankster, the Filipino Monkey. Iranian Navy Commander Rear Admiral Habibollah Sayyari said at a press conference on Thursday that the naval maneuvers dubbed Velayat 90 will start on Saturday and will cover an area stretching from the east of the Strait of Hormuz in the Persian Gulf to the Gulf of Aden. According to Sayyari, this is the first time that Iran’s Navy carries out naval drills in such a vast area. He added the exercises will manifest Iran’s military prowess and defense capabilities in the international waters, convey a message of peace and friendship to regional countries, and test the newest military equipment among other objectives of the drills. Rear Admiral Sayyari said that the newest missile systems and torpedoes will be employed in the maneuvers, adding that the most recent tactics used in subsurface battles will also be demonstrated in the maneuvers. He also said that Iranian destroyers, missile-launching vessels, logistic vessels, drones and coastal missiles will also be tested. With all those torpedoes, missiles and drones running around, what could possibly go wrong? Given the level of posturing by both the US and Iran lately over nuclear technology, assassination plots, spies and drones, these naval wargames seem particularly ripe for generating the type of “misunderstanding” that can quickly escalate to outright hostilities. Throw in the wildcard of spurious, but well-timed, radio provocation, and the Filipino Monkey could move from comedy to tragedy in the blink of an eye. https://www.emptywheel.net/wp-content/uploads/2016/07/Logo-Web.png 0 0 Jim White https://www.emptywheel.net/wp-content/uploads/2016/07/Logo-Web.png Jim White2011-12-22 11:05:232011-12-22 11:05:23Iranian Navy Plans Wargames for Saturday: Will the Filipino Monkey Show Up?